'On stage I have always been surrounded by French and Gypsy musicians as well as musicians from the Eastern nations - because this mix is my universe, my world and it is the only thing which brings me the stability I need in order to live and to survive, like the balance that is found in the bosom of a large and closely-knit family. Among us there are no castes and when the time comes for singing and breaking bread, the time for dancing, the people becomes king'. As my seventh year of blogging approaches I find myself less and less interested in rumours about the next career move of a jet set conductor or the latest hyperbole lavished by the twittering classes on last night's BBC Prom. Which is just fine; celebrity classical music is well served elsewhere leaving me to find sustenance where the people rather than personalities are king. Which brings me to the musician who supplied my opening quote. 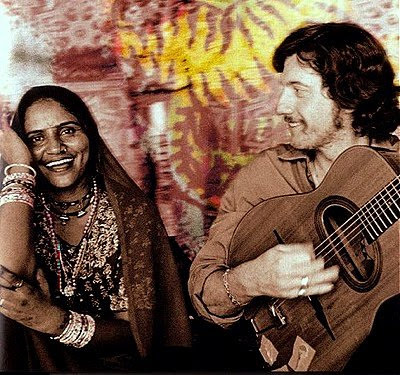 Titi Robin, seen in my first two photos with 'the gypsy queen of Rajasthan' Gulabi Sapera, is a self-taught French composer and musician who plays guitar, buzuk (small Middle Eastern lute) and oud. As well as spending time with Roma and Sinti people he has travelled extensively in the East including a pilgrimage to Ajmer in Rajasthan, the holy city where the Sufi saint Khwaja Moinuddin Chisti is buried. More than thirty years of travel, both physical and spiritual, have moulded Titi Robin's music, but above all it is diversity that he celebrates. Around one quarter of the French population has at least one immigrant parent or grandparent, and this creates one of the largest global markets for world music. In French retail outlets browser space devoted to world music exceeds that for classical and there is a huge range of new world music releases which contrast sharply with the tired Chopin and Mahler re-issues from the big classical labels. France's cultural diversity and strong links with North Africa are reflected in its world music artists who long ago left behind the self-conscious fusion offerings still so fashionable in less inclusive northern Europe and North America. World music from France embraces styles as diverse and inclusive as the ethnicity of the population, burqa bans notwithstanding. 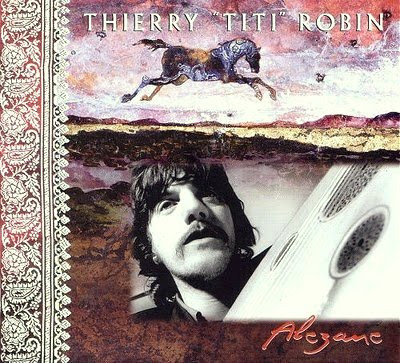 Titi Robin grew up in a rural community outside Angers in western France with gypsy and North African neighbours and this is reflected in his unique blend of gypsy, tzigane and Arabic music. In the paragraph above I discussed world music at some length, but interestingly Titi Robin rejects the very concept, as is explained elsewhere. 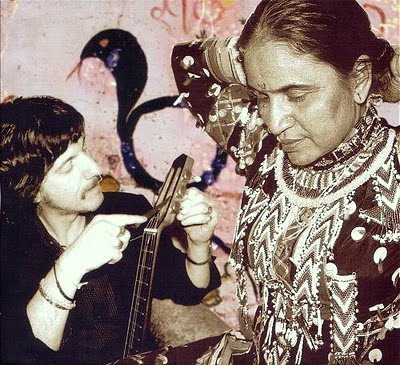 My first exposure to Titi Robin's music was through the Accords Croisés Jaadu Magic album where he improvises on Sufi texts with Pakistani qawwali singer Faiz Ali Faiz and, quite appropriately, I bought that album last year in the capital of world music, Paris. While in western France recently I bought and spent time listening to several other Titi Robin albums and I now want to share these with readers. Alezane is a thoughtfully programmed double CD compilation from 2004 which provides a useful overview of Titi Robin's music and is also the source of my header and footer quotations. 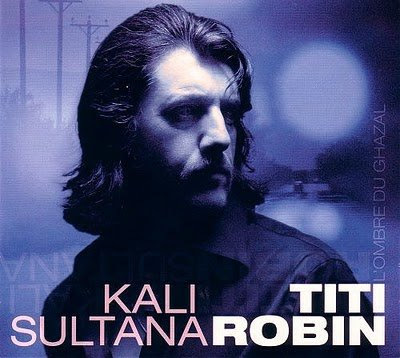 Gitans was his 1993 breakthrough album and it has been described, with some justification, as one of the best albums of gypsy music ever recorded. 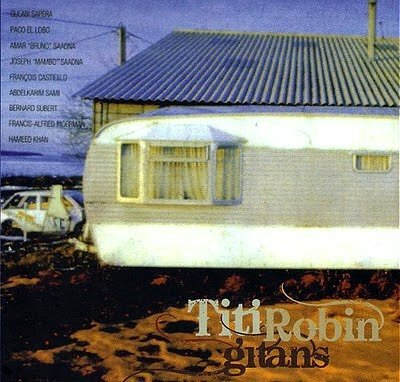 The title means 'Gypsies' and Titi Robin's musique sans frontières is rooted in the nomadic cultures of the Roma and Sinti which contrast with the sedentary urban culture that is the home of what is referred to above as 'Western ethnic music' and in which the celebrity caste system still rules. 'The Black Queen represents the beauty every artist seeks ... she can be very violent, but this violence also makes it possible to express and to resolve things'. Kali Sultana is scored for gumbass, oud, buzuk, guitar, accordion, saxophone, clarinet and percussion, with viola and cello backing using Eastern style unison writing and Arab (or gypsy) scales. The result is mystical and hypnotic without ever losing forward momentum and the discs returned to the CD player many times during our recent travels. Strange isn't it? - if Kali Sultana was released on ECM there would be a big buzz about it, instead it remains a very well-kept secret on Naïve. 'The real journey is inside of you. Music feeds from that source, from the bottom of your heart, under your star, because there is no better place elsewhere and there is no golden age in the past'. I'd like to second the crooked timber testimonial that I've never regretted clicking on any of your links or hearing music that fascinates you. And you're the kindest curmudgeon imaginable, even when you're trying to be severe.